Source: Sifco Selective Plating, Division of SIFCO Industries, Inc.
By Derek Vanek, SIFCO Selective Plating Co.
Brush plating is not a brand new technology, in fact, it's been around for over 40 years. However, industrial brush plating of large parts and systems isn't typically a wide-spread practice. Unlike traditional plating processes, brush plating can be done on-site and, for this reason, is ideal for spot plating a particular surface or for plating surfaces that are much too large to fit into processing tanks. In addition, it involves no heat generation that may distort the part. When it came time to plate sections of the International Space Station, The Boeing Company (Everett, WA), chose brush plating as its finishing process as the station components were much too large to be dipped into a plating tank. The International Space Station in Orbit Photo: The Boeing Co.
Over a period of roughly one year, more than 300 areas on various partially assembled components of the International Space Station were electroplated in-place at the Marshall Space Flight Center in Huntsville, AL, using a brush plating process developed by SIFCO Selective Plating (Cleveland, OH). Boeing engineers were looking at available options to apply localized coatings onto some very large components. The objective for brush plating was for an adherent deposit that would provide good corrosion protection, reducing electrical contact resistance and allowing uniform heat transference between mating components. The nature of the job lent itself to brush plating. A precise deposit thickness was needed on a localized area of a very large part. Assuming that a suitable tank was available, handling a component as large as the space station modules was no easy task. Further, the complexity of the masking involved was too time-consuming and the risk of catastrophic damage that could result from faulty masking would be high. Brush plating would allow the process to be brought to the part so, that with minimal masking to isolate the area to be plated and to control the runoff of solution, a high-quality controlled thickness deposit could be applied to a localized area. SIFCO met with Boeing engineers to establish the test criteria for the hundreds of samples that were plated. Each sample was destructively tested using both a bend test and an aluminum tape test to evaluate adhesion. The tests showed a direct correlation between panels passing the tape test and panels passing the bend test. This established a high level of confidence in the reliability of the non-destructive tape test to determine the adhesion of the plated nickel deposit onto the flight hardware. Boeing engineers determined that the optimum thickness of the nickel deposit needed to achieve the desired level of corrosion protection should fall within the range of 0.0015" to 0.0025". Operators applied the nickel deposits using the standard brush plating practice of plating until a calculated ampere-hour value was reached. Thickness was verified on the test pieces using beta backscatter. The material of choice was a Nickel (Acid), SPS Code 5600. 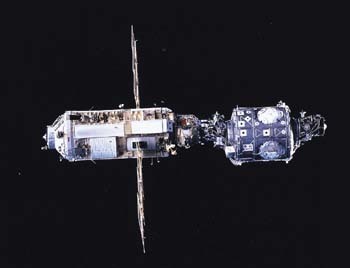 SIFCO was responsible for plating on both structural test articles (STA) and flight articles that included the STA Node, the STA Common Module, Node 1, the Lab and an Airlock. The pressurized space station components were made primarily of a 2219-T6 aluminum alloy that had to mate with hardware such as electrical, fluid, and gas connectors, as well as various brackets and grounding straps. The hardware material ranged from stainless steel to beryllium-copper. 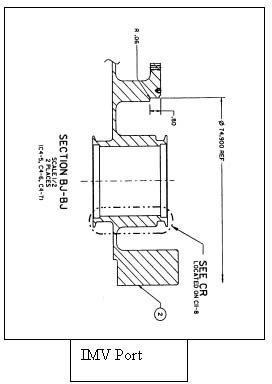 The brush-plated areas were typically hull penetrations that accommodate electrical connectors, feed through for various fluid or gas lines, and ventilation ducting such as d-holes, utility collars, and IMV flanges, as well as grounding strap contacts. Many of the hull penetrations such as the IMV ports had complex geometries with multiple areas that required precise, uniform thicknesses of nickel plating on both sides of the skin. Boeing engineers wanted an adherent deposit of uniform and accurate thickness that would meet their final surface finish requirements, either as plated or with minimal surface finishing after the plating operation. Each plated deposit was subjected to two tape tests. One by the vendor's QA and the other by Boeing's QA. Those deposits that did not pass had to be stripped and then re-plated. In order to achieve good electrical conductivity and uniform heat transference between mating parts, the plated deposits had to be flat. Flatness was measured using a piece of laser optical equipment called the Smart Cat. The Smart Cat was used to measure flatness and diameter on the components' skin. Measurement was a time-consuming, but accurate process that early in the project helped identify several areas that did not meet the flatness requirements. As engineers later discovered, the problem was due to the areas not being flat prior to plating. With proper anode design and plating technique, and given the fairly low thickness requirement for the nickel deposit, meeting the after plating flatness criteria was not difficult. In the early processing stages, surfaces were polished prior to plating. The theory was that a smoother surface before plating would result in a smoother surface after plating - eliminating, or at least minimizing, any post-plate polishing requirements. So a requirement was established to not etch too aggressively in order to preserve the polished surface finish. The minimal etch requirement did provide a better as-plated nickel surface, but unfortunately, it resulted in adhesion failures. Additionally, polishing prior to plating, more often than not, destroyed a previously flat surface. So the post-plating polishing often broke through the nickel and exposed the high areas of the underlying aluminum. This problem was eliminated by keeping any pre-plating polishing to a bare minimum and also verifying surface flatness before plating. Surfaces to be brush plated were classified as either Type I or Type II. Type I surfaces were non-sealing; typically electrical grounding applications that had a minimum finish requirement of 125 microinches Ra. Type II, sealing surfaces required post plating finishing to either 16 or 32 microinches Ra. Most of the work done on the space station required the plating to be done either working from scaffolding or from lift platforms that could be easily moved to get to the numerous areas that had to be plated. Plating was typically carried out in teams of two. An operator and a support person. The support person would either be located on the ground or inside the module "can." The "cans" were placed on rollers and were positioned to facilitate work on a specific area. Quite often an area that needed nickel both inside and outside had to be plated in two steps. For instance, an outside flange and bore could be plated from almost any position that the can was in, but plating the inside surfaces had to wait until the can could be rotated to a more accommodating position. One of the big concerns of the Boeing engineers was accidentally spilling preparatory and plating solutions onto the "flight hardware." Most of the areas that required plating were in the vertical position - holes going through a wall. A typical area had an outside face, a bore, and an inside face. Because these were through holes, masking and solution recovery devices were needed on both sides of the wall so there was twice the opportunity for solution leakage. SIFCO operators very carefully masked each area to be plated using a combination of aluminum tape, masking paint, and trays that were modified to fit the contour of the surfaces they were placed against. Discrepant nickel deposits fell into three categories: Burn through was a term used to describe what happened when the post-plate polishing went completely through the nickel deposit to the underlying aluminum. Chipping and flaking were often caused by poor finishing techniques such as polishing too aggressively against a high edge buildup area. And finally, adhesion failure, which was inevitable when plating hundreds of areas on 2219 aluminum forged and plate material that was not 100% homogeneous. Rather than repair damaged nickel and deal with both Al and Ni for reactivation, areas were re-worked by stripping the Ni with a 50/50 mix of sulfuric acid and water plus 50ml of glycerin, used at 12V reverse polarity until amperage stabilizes at roughly 1A and starting over. This method worked very quickly to remove the nickel without affecting the Al 2219. Over a period of a year and a half, more than 300 areas critical to the proper operation of five components of the International Space Station were brush plated at the Marshall Space Flight Center in Huntsville, Alabama. The portability and flexibility of the brush plating process allowed it to be used on-site and on demand. It fit into a complex schedule of operations and helped the Boeing Engineers in Huntsville to complete their project on time. Sifco Selective Plating, Division of SIFCO Industries, Inc., 5708 Schaaf Road, Cleveland, OH 44131. Phone (216) 524-0099; Fax (216) 524-6331. Derek Vanek is currently the Marketing Manager at SIFCO Selective Plating. He participated in the brush plating operation in Huntsville, AL. Sifco Selective Plating, Division of SIFCO Industries, Inc.